We are pleased to welcome you to St. Francis of Assisi for your wedding! Organising wedding music is one of many details to arrange in the lead up to the big day. If you wish to have music at your wedding, of course you will want beautiful and suitable choices of music, which are performed well. The following information relates to available music resources for your wedding at St. Francis of Assisi. * St. Francis Church was built for sound! The acoustic of St. Francis is one of the finest in Sydney for church music. It has a very generous ambience with a reverberation of 2-3 seconds, ideal for the performance of live music and especially suited to organ, choral and instrumental music. * St. Francis’ has a highly qualified team of professional church musicians who are able to help with choices and performance of suitable music for your wedding. Our liturgical musicians are experienced in Catholic wedding ceremonies and are able to tailor the music to accompany the various actions in your wedding service. e.g. movement to and from places in the sanctuary. Such skills give the impression of a “seamless” and smooth service. Recorded music or untrained musicians cannot do this. Copyright: the use of some recorded music may require the permission of the publisher and/or record company. Performances of copyright recordings, captured on video, may also be illegal unless the appropriate licenses are obtained. Our organists have a wide repertoire of music available for you to choose from. Some popular choices are detailed below. * A CD of wedding music for organ (recorded in St. Francis) is available to assist you with your choices. It contains both well known and favourite wedding music as well as other pieces suitable for bridal processions and signing the register. * If you wish to engage a singer, we can offer trained cantors (women or men) who can sing solo songs as well as lead the musical parts of a sung liturgy, e.g. consider having the psalm and alleluia sung by the cantor. * Solo singers are welcome to sing during the service. It is appropriate that sacred music is selected and choices of music should be discussed with the Director of Music. If you have a particular piece of non-sacred music in mind, please consider having this at your reception. * If you wish to engage an instrumentalist, we are happy to make recommendations from the network of professional musicians associated with our parish: trumpeters, string players, harpists and many others. * Arrangements can also be made for strings quartets or small orchestras. Fees are available on request. * The presence of a choir can be a very effective way of enhancing your wedding service with beautiful sacred music. * The Choir of St. Francis of Assisi is a robed liturgical choir of women and men with a wide repertoire from Gregorian chant and classical polyphony to more contemporary sacred music. * A selection of choral music may be made to suit a simple service or a full nuptial Mass. Our Director of Music will assist you with planning a choral liturgy. Fees are available on request. Noel James Debien began his musical studies at an early age under the Brigidine sisters, and by 11 was a boy treble in the Choir of St. Augustine’s College, Brookvale in Sydney under the direction of friar and musician Patrick Fahey O.S.A, Peter Bohrsmann and Ann Sutcliffe.. He studied music in the Music department of the University of Sydney under Professor Platt, Winsome Evans, Peter Sculthorpe, Nicholas Routley, Allan Marret and Graham Hardie where he sang in Pro Musica Choir, the Sydney University Chamber Choir and the Choir of St James, King st. Sydney 1979-80 (directed by Walter Sutcliffe). He joined the Choir of St Mary’s Cathedral choir in 1981-82 (directed by David Russell), touring Europe with them in January of 1982, and began his theological studies in 1982 at St Columban’s seminary and then St Patrick’s Manly 1983-87. He became the Praefectus Musicae for the Seminary Choir (ATTBB) 1985-87. During this time he founded and directed the Ars Gratia Christi Chamber choir (SATB). On the completion of the S.T.B. 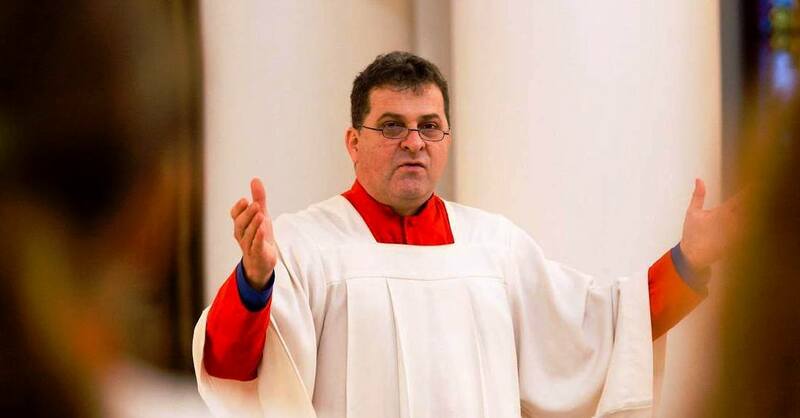 (the Roman degree) and the Bachelor of Theology (the Sydney College of Divinity degree) he began teaching at Mercy College Chatswood (1988), where he directed the SSA choir, and then at St Vincent’s College Potts Point (1989-1994) where he directed the SSAA choir. He was also appointed Director of Music at Mary Immaculate church Waverley (1988-94) for the Vigil Masses, and also directed the John Paul Choir. During this period he also sang on Sundays with the Choir of Christchurch St. Laurence and was a member of the concert tour choirs to both New Zealand and Europe. In 1995 he taught theology and literature at the Masaryk University in Brno, the Czech Republic, where he was a professional member of the Brno Madrigal Quintet, directed by Roman Valek, and toured in Europe. He was also a member of the Choir of the Brno Konservatoř (Conservatorium), also under the direction of Roman Valek – competing in the international choral competition at Cantonigros in Spain. During 1995, he also toured Austria with the choir of St George’s Cathedral Limburg (Lahn) under the direction of Hans Bernhardt. On returning to Australia in 1996, he sang with the Choir at St Francis Paddington, as well as subbing with the new professional choir at St James’ King St and the Australian Chamber Orchestra Voices on Australian tour. He was appointed director of Music at St Francis Paddington after the Easter Season of 2006. The Choir of St. Francis of Assisi is an S.A.T.B. (soprano, alto, tenor, bass) liturgical choir with a membership of 40 active choristers. The choir sings at the 10.00am Mass and major feasts, enhancing the parish liturgies with sacred music from an extensive repertoire ranging from Gregorian chant, classical polyphony through to contemporary works. Since 1998 the choir has presented an annual orchestral Mass on the Feast of Christ the King. St. Francis’ Choir has been in demand for engagements outside the parish, singing for many special liturgies including Masses at St. Mary’s Cathedral, The Australian Catholic Bishops’ Conference, Sydney College of Divinity, and has participated in the special BBC Songs of Praise recorded at the Sydney Opera House. The Choir is available for weddings and has a wide repertoire suitable to enhance such an occasion. Fees are negotiable. More information is available from the Director of Music. Am considering using your lovely Church for a classical concert of Choir and small orchestra. Could you let me know the seating capacity please and also the person whom I should contact. I’m not sure the seating capacity, but the choir does not handle these bookings.